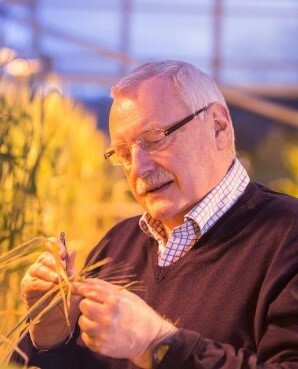 His personal research interests are at the interface of plant genetics, genome science, plant breeding and conservation of genetic resources with a strong emphasis on the delivery of ‘public good’ outcomes. He has published extensively and has an outstanding scientific publication record together with a well-established network of national and international collaborators and contacts. Wayne’s leadership experience spans the Public, Private and University sectors, with a strong International focus. He is a Fellow of the Learned Society of Wales and the Royal Society of Edinburgh. Before joining SRUC, Wayne was Chief Science Officer at CGIAR. CGIAR is the world’s premier global agri-food partnership, dedicated to help achieve the sustainable development agenda of healthy diets from sustainable food systems for all. Prior to this he was Professor and founding Director of the Institute of Biological, Environmental and Rural Sciences (IBERS) at Aberystwyth University where he led the merger of the Institutes of Biological and Rural Sciences of the University with the BBSRC Institute of Grassland and Environmental Research (IGER) to form one of the largest groups of academics and support staff in the UK focussing on plant, environment and land based sciences. He is a senior Fullbright Scholar and worked for the DuPont Company in Wilmington, Delaware, USA, where he gained exposure and experience of operating in a global private sector organisation. His current external roles include membership of the Science Advisory Council of DEFRA and Convenor of the Research and Knowledge Exchange Committee of Universities Scotland. Professor Wayne Powell joined the SSAC on 01 January 2019.